A planning scheme is a legal document prepared by the local council or the Minister for Planning, and approved by the Minister. It contains policies and provisions that control land use and development. Planning schemes apply to all private and public land in Victoria and are generally binding on everyone, with some exemptions. The administration and enforcement of a planning scheme is the duty of a responsible authority. In most cases this will be a local council, but it can be the Minister administering the Planning and Environment Act 1987 or any other Minister or public authority specified in the scheme. The planning scheme, amendments and related documents can be viewed free of charge during office hours at the offices of the responsible authority and on the department's website. 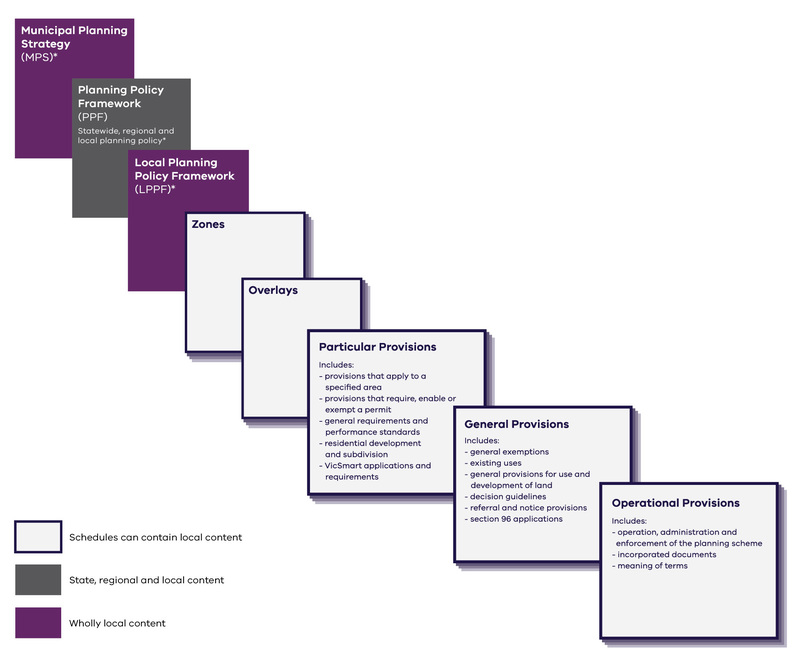 All planning schemes have a standard structure drawn from the Victoria Planning Provisions (VPP) and specified in the Ministerial Direction on the Form and Content of Planning Schemes. Maps showing how land is affected by zones and overlays. The ordinance setting out the written requirements of a scheme. Incorporated documents such as the Code of Practice for Private Tennis Court Development. Every planning scheme must include each part of the Victoria Planning Provisions in the same order (see diagram). Provides general information about a planning scheme and its components, who it affects, how to find out what applies to your land, changes to a scheme, applying for a permit, relevant legislation and where to get more information and help. Every planning scheme includes the State Planning Policy Framework (SPPF) containing general principles for land use and development in Victoria. Planning authorities and responsible authorities must take these general principles and specific policies into account in their integrated decision making process. The LPPF must be consistent with the SPPF. the strategic basis for decision-making by the responsible authority. The MSS is dynamic. It’s reviewed and added to periodically to make sure it responds to the changing needs of the community. A local planning policy is a policy outlining how the authority will implement the strategies in the MSS. A local planning policy states what the responsible authority will do in specific circumstances, or the responsible authority's expectation of what should happen. It gives a responsible authority an opportunity to state its view of a planning issue and its intentions for an area. A local policy provides guidance to decision making on a day to day basis, which is not always achievable in the Victoria Planning Provision (VPP) zones and overlays. It can also help the community understand how a proposal will be considered and what will influence decision making. Local policies must be taken into account when preparing amendments to the planning scheme or making decisions under the scheme. The responsible authority must decide whether the proposal will produce desirable outcomes. All land in Victoria has a zone. Zones specify particular purposes for land, such as business, industrial or residential. They show what the land can be used for, and include controls relating to buildings and works and subdivision. Standard zones for statewide application are included in the VPP and are used in all schemes as required. The first purpose of each zone is to implement the SPPF and LPPF, including the MSS and local policies. Each planning scheme only includes the zones required to implement its strategy. Responsible authorities can’t vary zones or introduce local zones; new zones can only be created with an amendment to the VPP. Some zones have schedules for local circumstances. A site or area can have overlay requirements in addition to the zone requirements. Generally, overlays apply to a single issue or a related set of issues (such as heritage, environmental concern or flooding). Where more than one issue applies to land, multiple overlays can be used. Standard overlays for statewide application are included in the VPP. Each planning scheme only includes the overlays required to implement strategy. Many overlays have schedules to specify local objectives and requirements. Particular provisions are specific prerequisites or planning provisions for a range of particular uses and developments, such as advertising signs and car parking. Particular provisions apply consistently across the state. Only particular provisions already in the VPP can be included in planning schemes and they apply in addition to the requirements of a zone or overlay unless specified otherwise. General provisions are operational requirements which are consistent across the state. They include matters such as existing use rights, administrative provisions, ancillary activities and referral of applications. Terms used in planning scheme provisions should be consistent with their meaning in the Planning and Environment Act 1987 (the Act) or the Definition section of the scheme. Other terms have their ordinary meaning; a dictionary is commonly used to define them. The Planning and Environment Act 1987 allows certain documents to be incorporated in a planning scheme by reference, rather than by physically including them in the scheme. Certain classes of application are specified as State VicSmart applications which are subject to a more straightforward and streamlined assessment process. Local classes of VicSmart applications can be identified through schedules. This list includes all local amendments which have amended the scheme and all amendments to the Victoria Planning Provisions which included a consequential amendment to the scheme. A brief description of each amendment is provided. A set of standard provisions for planning schemes called the Victoria Planning Provisions (VPP) is created by the Minister for Planning under the Planning and Environment Act 1987 (the Act). These provisions form a template for all planning schemes. From time to time the Minister issues directions to planning authorities about the form and content of planning schemes, guiding how they’re constructed. The VPP is a state-wide reference document or template used to source and construct planning schemes. It’s not a planning scheme and doesn’t apply to any land. The VPP and the Ministerial Direction on the Form and Content of Planning Schemes ensure that the construction and layout of planning schemes is consistent across Victoria. It provides the framework, standard provisions and State planning policy. The planning authority (usually the local council) must provide the local planning policy content, including a Municipal Strategic Statement, and select the appropriate zones and overlays from the VPP for inclusion in their planning scheme. The VPP also has references to incorporated documents (see tab) common to all planning schemes. The suite of standard zones in the VPP is designed to be flexible so State and Local Policy Frameworks need to provide clear guidance for decision makers and applicants. Councils can only select zones and overlays from the VPP. Amendments to the VPP are made as needed to keep the VPP up to date and abreast with changes in policy and practice. Amending the VPP is similar to the planning scheme amendment process, but only the Minister for Planning - or other Minister, public authority or local council authorised by the Minister - can prepare an amendment to the VPP. Only the Minister for Planning can approve an amendment to the VPP. An amendment to the provisions of the VPP will also amend specified planning schemes which include those provisions. When the VPP amendment is approved, the schemes are amended at the same time. The Minister, the responsible authority, each local council and any person whom the Minister specifies, must keep an up to date copy of the VPP available for public inspection during office hours. If you keep a paper copy of the Victoria Planning Provisions (VPP) or any Victorian planning scheme, replacement page instruction sheets are available for every amendment to a planning scheme ordinance gazetted since 21 August 2006. The instruction sheet will help you identify which amended planning scheme pages need to be printed if you need to update a hard copy of your planning scheme or VPP. The replacement page instruction sheets can be located in Planning Schemes Online. Select the Planning Scheme from the drop down menu. Enter the amendment number or a keyword in the Keyword field. Select the Approval tab at the bottom of the page. The replacement page instruction sheet can be found under the heading Instruction sheet. Click the link to download and print this sheet. The Planning and Environment Act 1987 allows certain documents to be incorporated in a planning scheme by reference, rather than by including them in the scheme itself. the Schedule to Clause 72.04 (local) of the planning scheme. Generally, where reference to a document is specifically required because the document affects the operation of the planning scheme, the document, or relevant part of the document, should be incorporated and read as part of the scheme. You can view most incorporated documents in a planning scheme by going to the relevant planning scheme online and selecting the Incorporated documents tab. If an incorporated document is not available online, you can visit the relevant council to view a copy. Documents which have been incorporated into a planning scheme by a local council (Schedule to Clause 72.04) form part of that planning scheme. They must be available for inspection at that council's offices and at the department's offices. As part of every planning scheme, statewide incorporated documents (Table to Clause 72.04), they must be available for inspection at any local council and at the department's offices and website. If a document is not available online, please contact the relevant departmental office or the council to make an appointment to view it.